The beautiful Heaps Building in Winnipeg, Manitoba was designed by Darling & Pearson in 1910 to be a reflection of the “free renaissance” style. These architects were well known as some of the best bank architects in the country. The Bank of Nova Scotia was well aware of their talents when they chose them to design this Winnipeg landmark. The terra cotta façade and dome of the building hides a frame of steel, making the building incredibly sturdy. When exposure to repeated freeze and thaw cycles resulted in significant deterioration of the terracotta dome, restoration was a necessity. 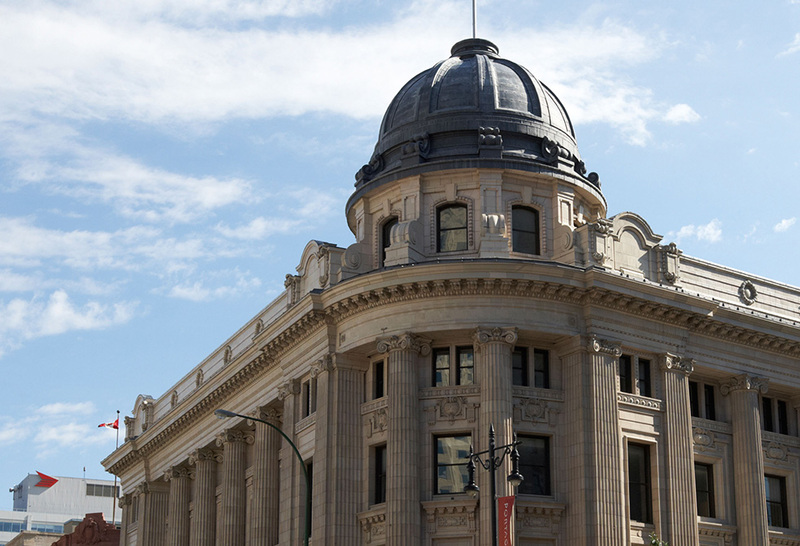 Heather & Little was proud to help take on this project and restore the timeless beauty of this heritage building. Sheet lead was chosen to cover the deteriorated terracotta. 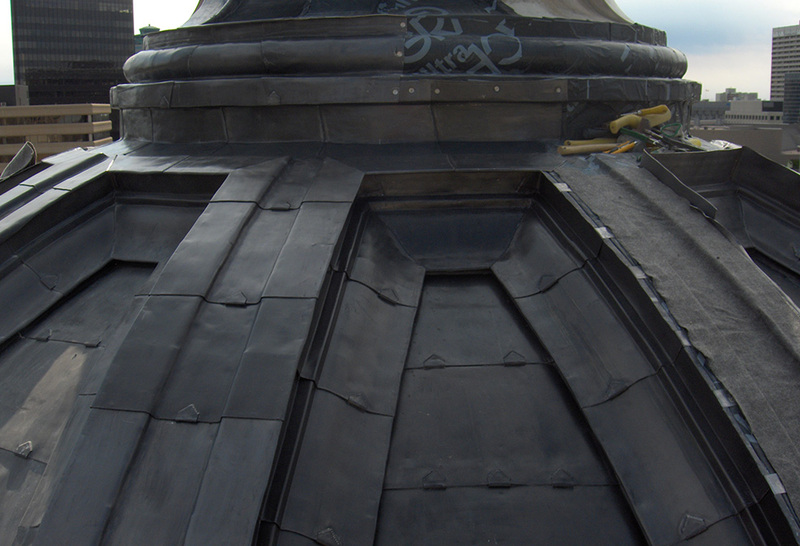 When Heather & Little took on this sheet lead roofing project, the deterioration on the dome was beyond repair by any normal restoration methods so the Architect decided to clad the dome in sheet lead because of the extreme malleability which permits forming over almost any detail without excessive preparation or hand work. Such work would not have been economically feasible in any other common metal and a fraction of the cost to replace the terracotta. 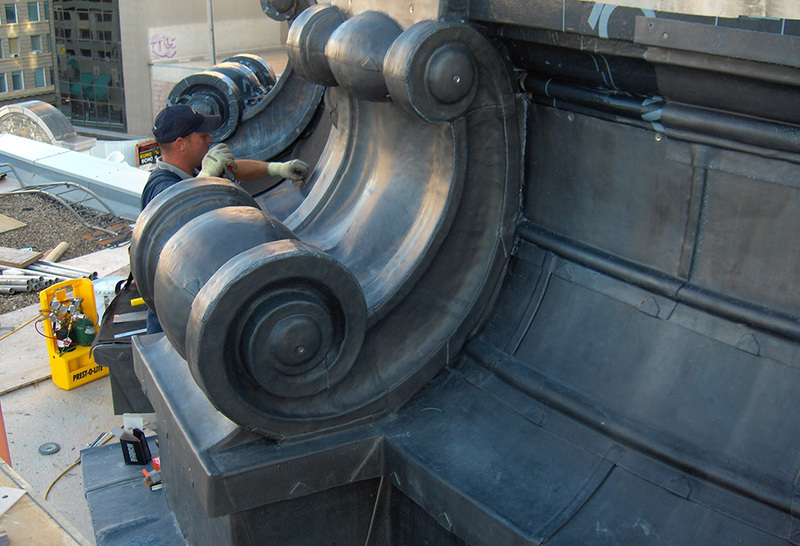 The sheet lead roofing restoration began with filling pockets in the stone with mortar then installing a layer of waterproof membrane over the entire dome. We covered the entire terracotta stone dome, base and volutes with new sheet lead. 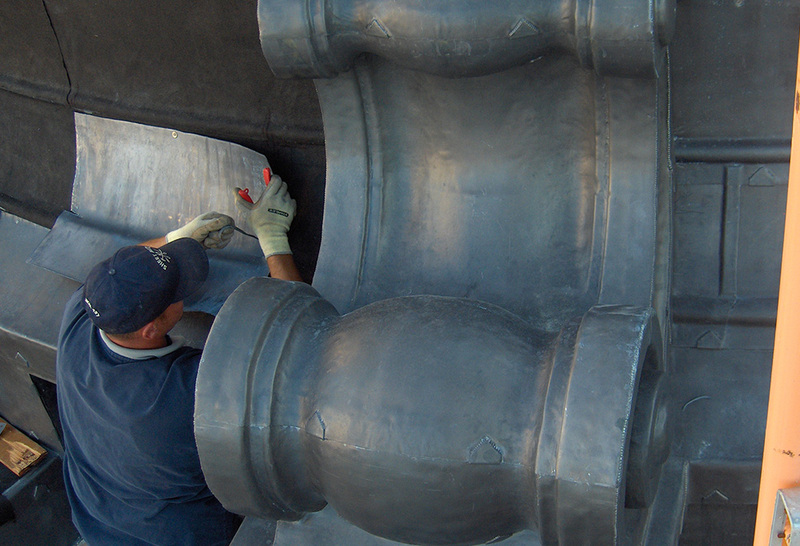 New sheet lead cladding was placed over ornaments and all details, ensuring that the entire structure would remain durable regardless of temperature changes and other environmental factors. The 2009 award-winning restoration of the A.A. Heaps building is part of Bridgman Collaborative’s ongoing vision and mission to help preserve heritage architecture for generations to come.